A paper has recently been published in Turkish by Hatice Pamir who is the main archaeologist working on Antioch at this time. 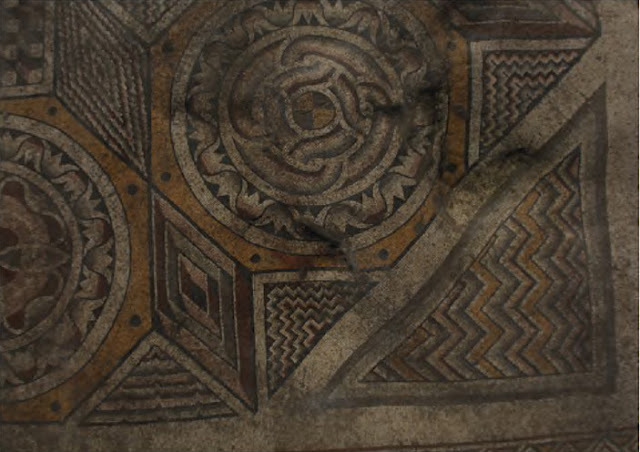 It has some interesting discoveries and images relating to what might appear to be the Forum of Valens or its fringes. 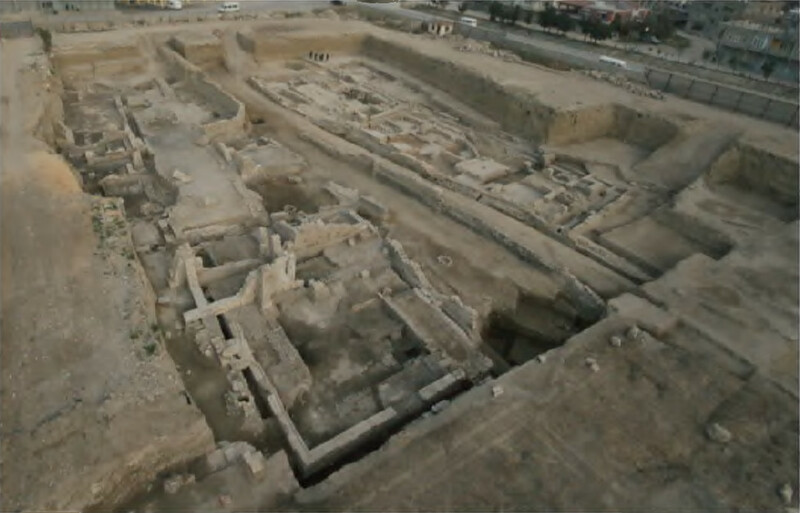 The excavation area is located in Haraparası quarter of Antakya, 750 m. southwest of the so-called St Peter’s Grotto, and next to the west side of modern Aleppo road (which tracks the old Colonnaded main street) and adjacent to the Hacıkürüs (ancient Parmenius) river on the north. While not mentioned in the article, I suspect that this is the site where the "Hilton" was being built. The excavated area lies on southeast-northwest direction parallel to the ancient grid plan of the city. The area was a suburb of Antakya in 1930s when it was mainly gardens/orchards and then a truck depot/garage for a long time before the excavation. 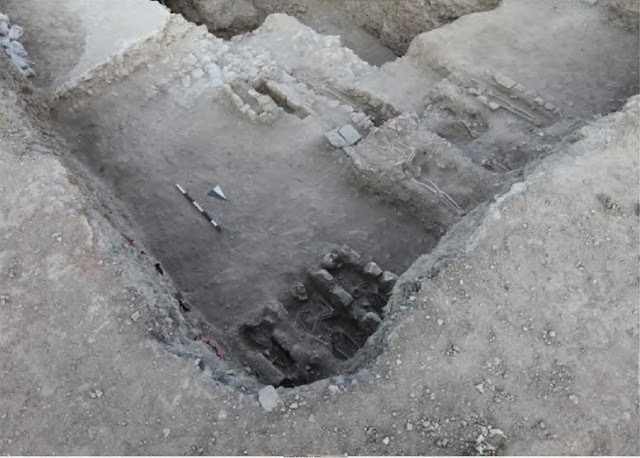 The rescue excavation provided knowledge of city’s historical sequence in one place. 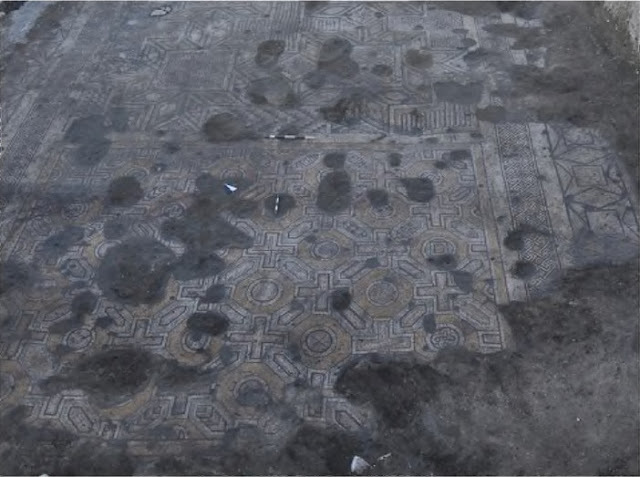 It was also the first systematic excavation since the 1930s, and has revealed four significant building remains: a public building of 5th-6th century AD., a bath complex, a villa of 5th century AD, a row of shops and a stone paved road in two different places. The preliminary analyses shows the area was actively occupied from Hellenistic to the Medieval times. While my Turkish is way less than proficient I was able to glean some key details of the discoveries. 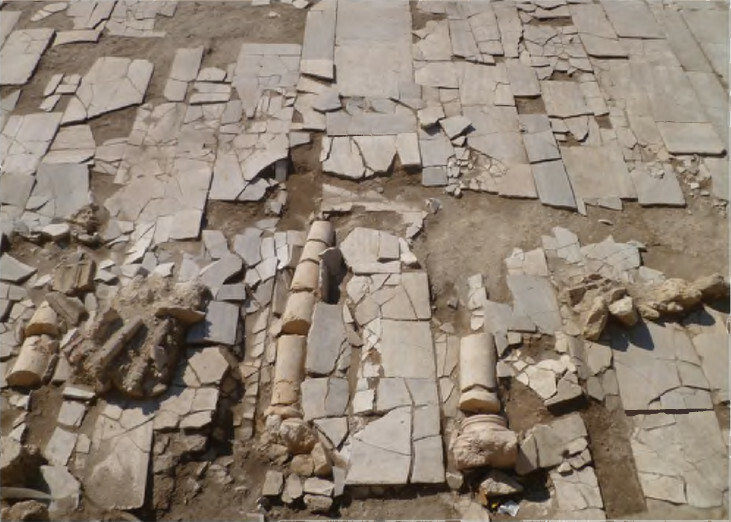 A decision was made in 2009 by the Hatay Archaeological Museum to do some drilling (sounding?) on the site. Based upon this work, a further decision to make a substantial excavation was made. As a result some six metres of overburden was removed and an area of a massive 180 metres by 95 metres was excavated. Some idea of the scale can be gauged from the people (little black dots) standing in the centre background of this photograph of the excavation. The site is challenging because over time the bed of the Parmenius "river" has shifted backwards and forwards across the plain at the foot of the mountains and in the process has destroyed some of the historic evidence. It has at time runs through the area excavated. Below can be seen the necropolis with around 50 graves counted. This relates to the same burial field uncovered in 1936 (numbered 16P at that time). The graves date from the 10th to 14th century. Under the graves was a totally different layer of settlement from the 5th to the 7th century consisting of side-by-side shops in an area 25m by 8 m, including storage areas with large ceramic grain-storage containers and some examples of two-colour "fish-scale" mosaics. The next area uncovered was a marble-floored atrium of exceptional size measuring 58 metres north-south and 70 metres east-east. A marble structure on the East-West axis has been destroyed by the river flow shifting over time. There is series of nine mosaic panels stretching along the west side. These are 14 metres wide and some 90 metres long. This is not some humble building and could indeed be the type of structure which might represent the core of the Forum of Valens. The sixth panel (?) was totally destroyed but there are many pieces of red and yellow glass from the destroyed mosaics. It seems the stone walls of this portico(?) were covered with frescoes. There was a layer of ash and burnt wood, interspersed with nails from a collapsed roof, signalling that the structure was destroyed by an earthquake or some sort of natural disaster (or the Chosroe attack). There is a gateway onto a main street and a collapsed colonnade (with the photo above showing the fallen columns). After the main destruction some of the surviving parts were re-employed as storage areas. The author speculates that because of an inscription on a fallen pediment including the Latin word "Curia" that this was some sort of "parliament". Previous commentators have always placed a Bouleterion in the older part of the Seleucid city, but it is possible that Valens moved important functions to his new forum to enhance its status. Under this structure at a depth of around 13 metres was discovered more Hellenistic remains, including the sizable triclinium (dining room) of a house, with some more spectacular mosaics reminiscent of those found at Daphne and elsewhere in Antioch in the 1930s. The figure is a Megalopsychia surrounding by pairs of male and female birds (shown below). The next discovery was some baths. 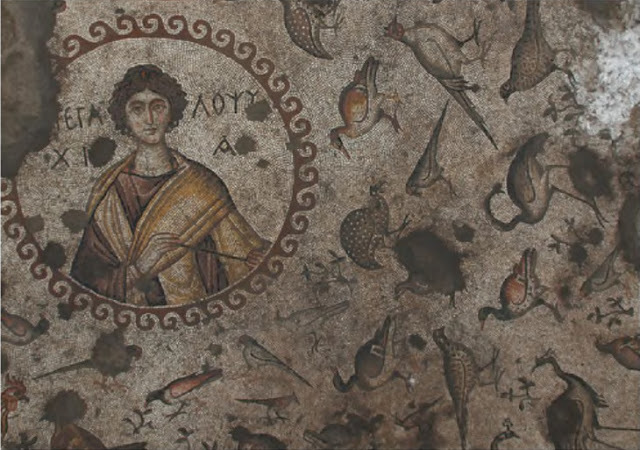 As noted in the past Antioch was famed for the number of bathing establishments and their decor. Below can be seen the floor layout with the floor supports and the hypocausts for distributing sub-floor heat to the various chambers and pools. In the frigadarium part of the structure some important finds were made including a headless Hecate Triformis statue and two marble lions. While these baths were not large they were certainly sumptuously adorned. 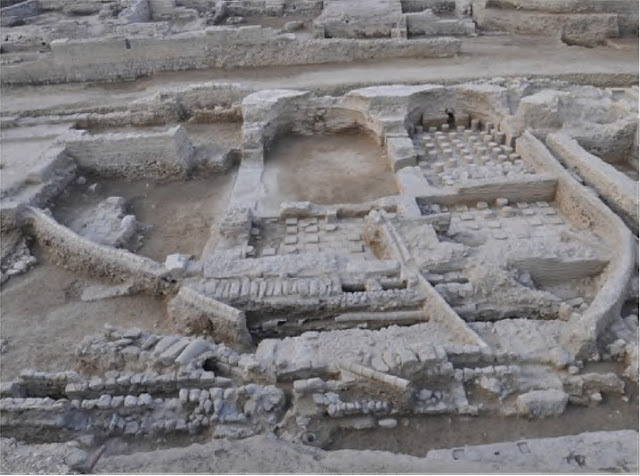 I am grateful to you for providing such immense knowledge in one complete article about the excavation at the forums of Valens. The pictures added in the article gives it more authenticity.